Saturday, December 2, 2017 Womanhood 101: Girls EmPOWERed New Orleans was held at the New Orleans Charter Science and Mathematics High School and was a truly amazing and powerful program. Guest Speakers Andrea Fullington, Christina Hull and Amani Black Pearl Vincent inspired our girls to not live within the limits that the world tries to set for women of color but to live within their power and rise beyond the expectations of the world by understanding self and others, building self-estee m, having self-respect and by developing a plan to build a personal business. Our girls participated in a team scavenger hunt, team cup stacking challenge and a team anti-bullying commercial challenge. One of the highlights of the program was when 11- year old Malina presented her Making Money Action Plan and her goals for entrepreneurship. 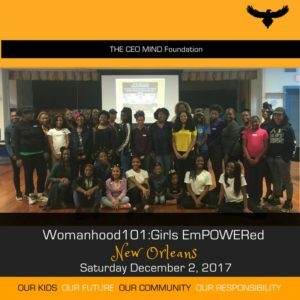 2017 has been an exceptional year as our Womanhood 101: Girls EmPOWERed Program has been able to impact and empower over 150 girls in Baton Rouge and New Orleans, Louisiana. We are expanding our geographical reach in 2018 but we need more change agents to make this happen! For our girls who did not have an opportunity to participate in Womanhood 101: Girls EmPOWERed in 2017, Womanhood 101: Girls EmPOWERed Baton Rouge will be Saturday, April 14, 2018 at the YEZ and Womanhood 101: Girls EmPOWERed Milwaukee will be Saturday, June 9, 2018 Milwaukee, Wisconsin (location TBD) and Womanhood 101: Girls EmPOWERed New Orleans, Saturday, September 8, 2018. Join the WE. Get involved. Stay engaged.